The study examines the idea of unity applied to deposit, explores the theoretical and practical ways in which the title concept (unity of deposit) operate in the special conditions of public international law and domestic law likewise. It analyses the building of the title concept as a result of cumulative elements added to it, the verification on observable evidence and the using in order to make new ideas out of it. A special focus is given to three basic international law concepts : sovereignty, territory, boundary. And consequently the "generality" of these basic elements for land and submerged lands are also addressed. The study deals with the mining factor in delimitations of State's territory, both on land and offshore. In so doing, it makes clear the concept of plurilinear boundary in order to explain the idea of Joint Development Zone (JDZ). The bringing together of legal categories, onshore delimitation and boundary legal category and offshore delimitation and boundary legal category, is scrutinized in order to show the existence of six basic territorial formulas, common to onshore and offshore State territories. The study opposes the idea of "no rule of international law" on petroleum cross-boundary fields question. It investigates customary international law on mining and petroleum rights, and it points out and deals with international responsability of States in the matter of divided hydrocarbon deposits. The study intends to lay greater stress on the need for complementary notions from internal law to be included up in the making of the unity of deposit concept, showing how a complementary notion does play an important role in making it practical. This is why the basic material concept proposed in the study is "gisement divisé" (divided deposit). It should be emphasized that this is done in order to show that the unity of deposit concept does not deal only with economic considerations but has to do also with security considerations, such as protection of human life on mining sites. The study takes on interest in technical aspects regarding production of hydrocarbon reservoirs and mining exploitation, both divided by international boundaries. It comes close to relations between law and engineering. Models of production for hydrocarbon divided deposits in international law and models of ownership formulas for reserves in such situation are determined. Appendices : no documents (treaties) enclosed. A special Bibliography relating to treaties and other diplomatic documents appears under the title REPERTOIRE DES TRAITES (RdT). Bibliography : 4 lists of books and articles appear, in the matter of 1/ International Law, 2/ Petroleum and Mining Law, 3/ Petroleum Production Engineering and Mining, and 4/ General Knowledge on Oil and Gas. Indexes : the 10 indexes (included in the complete original manuscript) are not published. 308 international treaties and declarations are listed in the REPERTOIRE DES TRAITES. 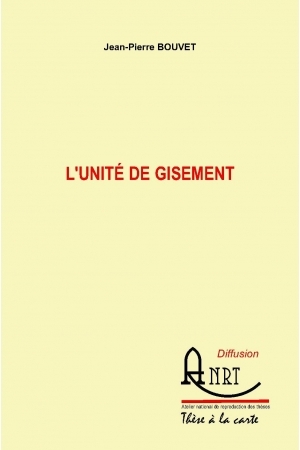 A number of bibliography references are indicated and a special focus about the text used in the book L'UNITE DE GISEMENT is pointed out.